On the face of it The Castle Pub opposite the entrance to Nottingham Castle should be my idea of perfection. I have been here on numerous occasions to enjoy a pint of Harvest Pale but I had never eaten here. The main reason being that it is usually really busy on a Friday night when I pass through, often just standing room only and can be tricky to find a table at which to rest my plate. It has never been too busy though for that pint of beer. 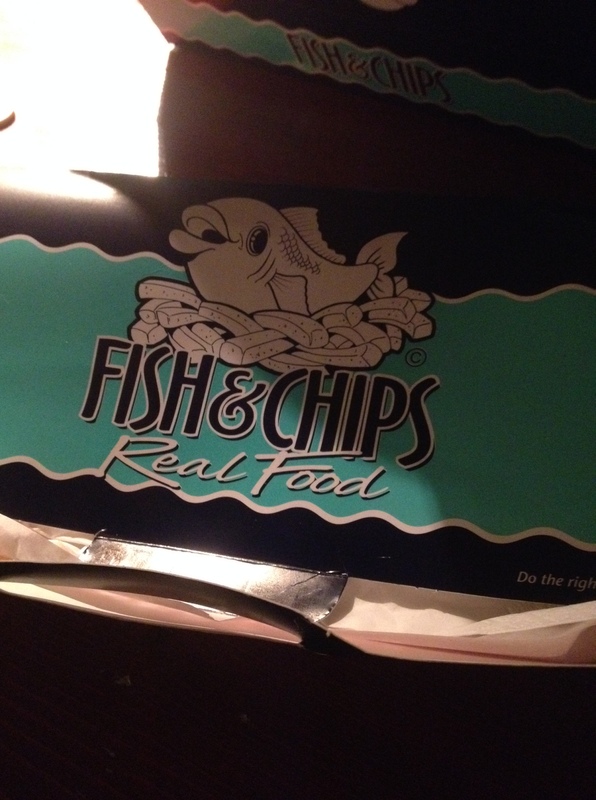 Recently I found myself in here when it was quiet, and I needed a pint of pale, so when I saw the sign for “Fish & Chips – eat in or take-away” I suddenly found myself in need of a plate of Fish & Chips. As it happened that plate was to be a box, but hold on a moment we will get to that. “The Chip Shop Menu” invites us or perhaps emplores the patrons to ‘Enjoy a selection of your favourite British dishes to eat in or takeaway’. 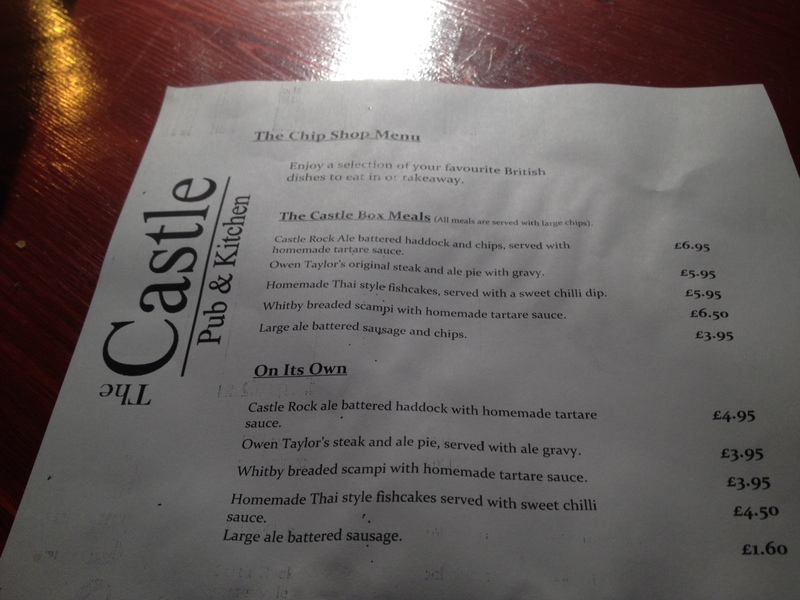 I scanned down the brief menu to ‘The Castle Box Meals’ section and quickly alighted upon the offer of ‘Castle Rock Ale battered haddock and chips served with homemade tartare sauce‘ for £6.95. That was going to be my selection, how could I choose anything else? I pondered momentarily about having a pie and chips, but the pie on offer was just too good, it was an Owen Taylor’s steak and ale pie, in a chip shop despite it all it’s reputation, it just has to be a Pukka Pie. Other options included Whitby breaded scampi and battered sausage, both classics, but when did a homemade thai style fishcakes become a chip shop staple? As promised my meal arrived in a box, but what will the inside of the box have to offer? Now I am a bit fussy or perhaps set in my ways when it comes to my Fish and Chips. I like a nice crisp light batter, juicy moist fish, preferably haddock, and freshly cut freshly fried chips. The Castle offering is not quite to my liking but that doesn’t mean that I didn’t like it or appreciate their efforts, The batter is a bit soggier and thicker than I would like, but I know a lot of people who like it like that. The fish was moist and plentiful. The chips were reasonable nothing to get too excited about but nothing to complain about either. It is a good sized meal in a big box that if I had from an actual takeaway and sat eating on a park bench would have done the job. The Castle Pub is part of the ‘ever so sensible restaurants’ group alongside it’s neighbour Watson Fothergills (another pub I like to frequent). 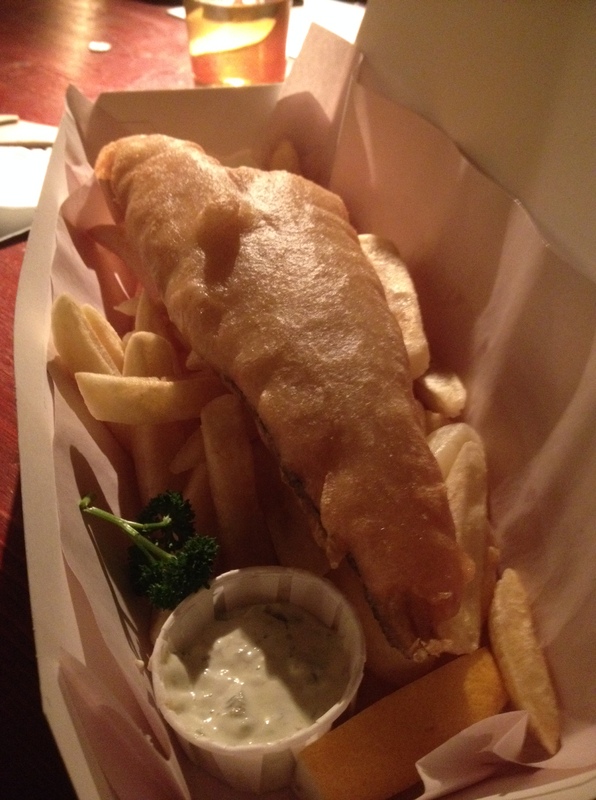 They also serve a beer battered fish and chips but for a more princely sum of £9.95. You pay a lot to use a plate these days.